If You find it in Your heart, can I be forgiven? Guess I owe You some kind of apology. By the saving grace that's over me. In a pine box for all eternity. For the saving grace that's over me. Wherever I am welcome is where I'll be. Is the saving grace that's over me. But to search for love, that ain't no more than vanity. There's only one road and it leads to Calvary. From November 1979 to May 1980 "SAVING GRACE" had often been one of the highlights of Bob Dylan's gospel shows, during which no "old songs" had appeared in the set lists. 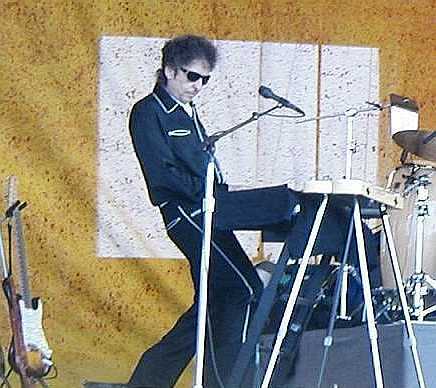 After almost 23 years, in February 2003, Bob Dylan performed the strong confession of "SAVING GRACE" three times in Australia, on his piano. The first one was sung in Canberra, during the first show of the year. Already at the next show, during a short festival set in Melbourne, this gem appeared again. The third concert, in Brisbane, featured "SAVING GRACE" once more. In April, in Dallas, "SAVING GRACE" was included into the first show of his first US tour of the year, with Bob on harp and piano, singing "There's only one road and it leads to Calvary" on Good Friday. In Austin on the next day "SAVING GRACE" appeared again with Bob on piano. The next performance of "SAVING GRACE" was six days later, in front of some 30.000 people at the New Orleans Jazz & Heritage Festival. Two days after this, in Tunica, Mississippi, "SAVING GRACE" was performed directly after "DIGNITY". Another two days later Bob performed "SAVING GRACE" in Nashville, and also on the next day in Louisville. In May it appeared in Charleston, S.C.; and then in Portsmouth, Virginia, where it was preceded once again by "DIGNITY". The next performance of "SAVING GRACE" was in Solomons, Maryland. In July "SAVING GRACE" was performed in Tampa, Florida, on the same night where Bob Dylan sang his first "GOTTA SERVE SOMEBODY" after almost 18 months. In August, more that three weeks later, "SAVING GRACE" appeared in Gilford, New Hampshire, in the same concert as "SE�OR" and "DIGNITY". In Europe during the fall of 2003 "SAVING GRACE" was not performed at all. After more than half a year of absence this gem reappeared during the first show of 2004, in Tulsa, for the first time ever in the same set as "EVERY GRAIN OF SAND". Already during the next three concerts, all of them in St. Louis, "SAVING GRACE" was performed again, during the third one once more in the same show as "EVERY GRAIN OF SAND". The next appearance of "SAVING GRACE" was in Chicago's Vic Theatre. Three days later it was sung again, in Detroit; and nine days after that "SAVING GRACE" appeared in Boston. One week after this "SAVING GRACE" was performed in Philadelphia. "SAVING GRACE" had its next appearance in June of 2004, in Salem, so there was hope for a European debut of this gem during the 2004 summer tour in Europe. I would have loved to witness a performance of "SAVING GRACE" in Belfast or in Galway, but it was not to be. In August 2004 however, in Brockton, Massachusetts, Bob Dylan chose to perform "SAVING GRACE" for the first time ever in the same set as "GOD KNOWS", and this during a show which also featured the third performance ever of "PO' BOY". Twelve days later, in Jackson, Tennessee, "SAVING GRACE" appeared in the same set as "STANDING IN THE DOORWAY". During the fall tour of 2004, "SAVING GRACE" appeared in October in Davis, California, in the same concert as "SE�OR". 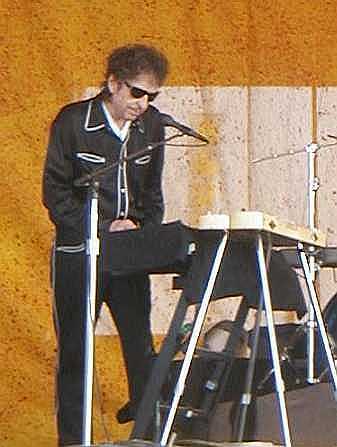 In November Bob Dylan chose to perform "SAVING GRACE" at Messiah College in Grantham, Pennsylvania, during a concert which also included "PO' BOY" and "DIGNITY". The first appearance of "SAVING GRACE" in 2005, including six instrumental verses, three of which with Bob on harp, was in March in Denver, in the same show as the first "BLIND WILLIE MCTELL" of 2005. Two weeks later, in Mt. Pleasant, Michigan, "SAVING GRACE" was performed again, this time in the same set as "BLIND WILLIE MCTELL" and "FOREVER YOUNG". From April 2005 until August 2012 "SAVING GRACE" was not performed at all by Bob Dylan, before during his North American Summer tour of 2012 he chose to sing one single, wonderful, word perfect version, sitting on his grand piano, in Johnstown, Pennsylvania. God, being rich in mercy, because of the great love with which he loved us, even when we were dead in our trespasses, made us alive together with Christ - by grace you have been saved - and raised us up with him and seated us with him in the heavenly places in Christ Jesus, so that in the coming ages he might show the immeasurable riches of his grace in kindness toward us in Christ Jesus. For by grace you have been saved through faith. And this is not your own doing; it is the gift of God, not a result of works, so that no one may boast. The Word became flesh and dwelt among us, and we have seen his glory, glory as of the only Son from the Father, full of grace and truth. And from his fullness we have all received, grace upon grace. For the law was given through Moses; grace and truth came through Jesus Christ. The wicked are like the tossing sea; for it cannot be quiet, and its waters toss up mire and dirt.�There is no peace, - says my God, - for the wicked. If we have been united with him in a death like his, we shall certainly be united with him in a resurrection like his. ... Sin will have no dominion over you, since you are not under law but under grace. Let all who take refuge in you rejoice; let them ever sing for joy, and spread your protection over them, that those who love your name may exult in you. By the grace of God I am what I am, and his grace toward me was not in vain. But he gives more grace. Therefore it says, "God opposes the proud, but gives grace to the humble."